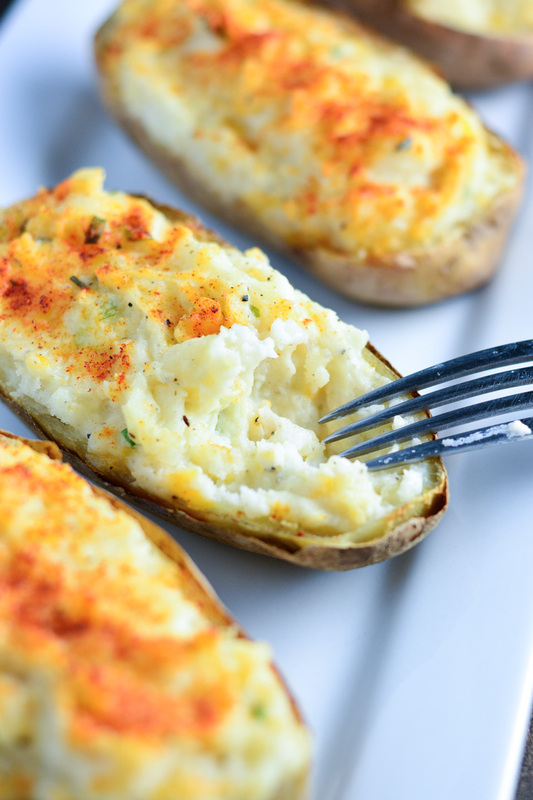 Make Twice Baked Potatoes for a perfectly portioned delicious creamy and cheesy dinner side dish that can be made in advance! “And here we have Idaho! Winning her way in fame…” And that’s all of the Idaho state song I can remember of the many trips to my mom’s home state with her singing as we crossed over the border. Do all states have a state song? 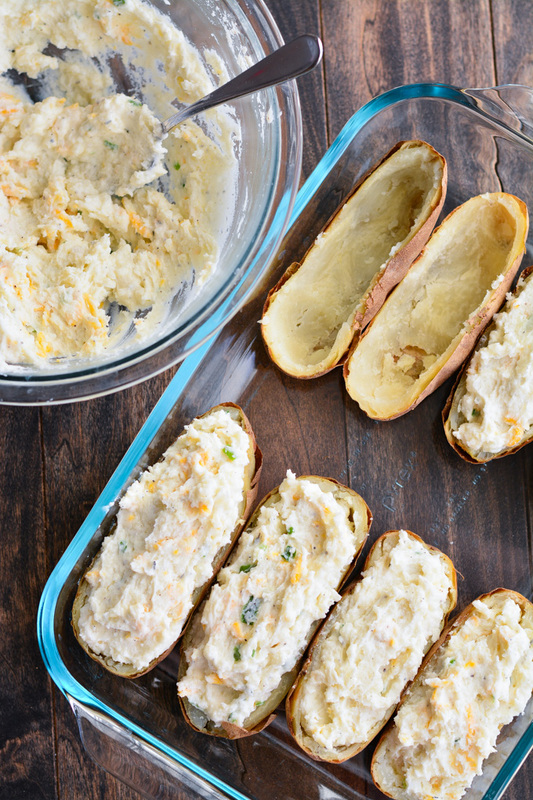 Well, I’m in Idaho right now so it’s only fitting that I post a potato recipe, right?! 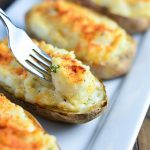 I’ve been eating these Twice Baked Potatoes since I was little and they are still my favorite potato side dish! And of course this is another amazing recipe from my mother (as good as her dinner and cinnamon rolls). Seriously guys, she should really be the one writing this blog. It’s thanks to her I can cook and have good recipes. But I should mention that I did a little tweaking to the recipe. I basically just cut down on the fat (sour cream, butter, cream cheese) by about a fourth (50 calories and 5 grams fat per serving!) so it’s really not that noticeable in taste… just your waste line. Don’t make any more adjustments/substitutions or you won’t get the same creamy delicious results. 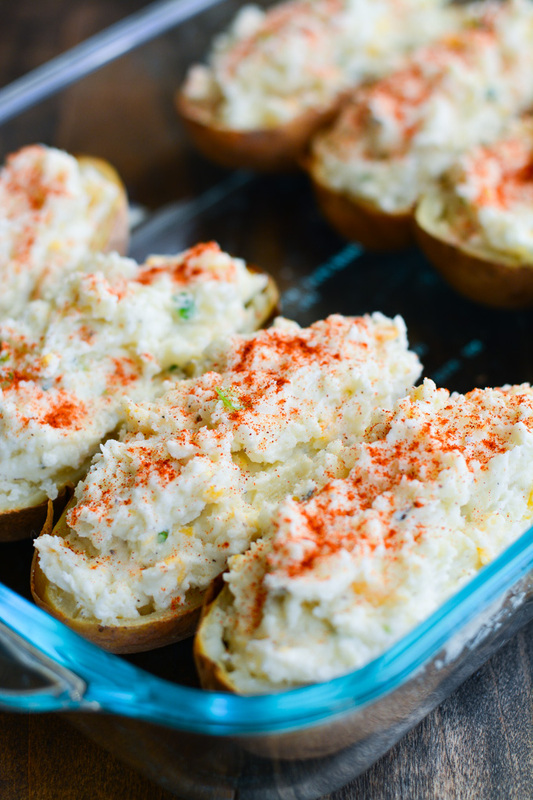 I have always been a big fan of potato skins and these are similar in that they are baked and loaded with cheese and green onions but I like that these are more filling since they are stuffed with mashed potato… and cream cheese, sour cream, and butter. You can eat just the inside but I prefer to also eat the skins after eating most of the inside. These potatoes are a definite favorite in my family. When my siblings and I were kids, twice baked potatoes were often requested as part of our birthday dinners along side another favorite– beef brisket. They are also really good along side baby back ribs. First, you’ll wash and then poke the potatoes with a fork. Poking the potatoes allows the steam to escape the potato without it exploding. Believe me, you don’t want to clean that up. After baking the potatoes and letting them cool enough to handle, you’ll cut the potatoes in half lengthwise and scoop out the flesh and place it in a large mixing bowl. You can then proceed to add the other ingredients to make the filling- sour cream, butter, cream cheese, seasonings, cheese… there is so much yummy goodness in there! Once mixed, place the filling back into the shells. Finish it off with a dusting of paprika and at this point you can pop them in the oven and enjoy in 20 minutes or you can place them covered in the fridge for later. Hand Mixer– I love my hand mixer. I use it for everything from frosting, to whipped cream, to mashed potatoes. When cool enough to handle, cut potatoes in half lengthwise and spoon out the inside and place in a large mixing bowl. (Leave about a 1/4 inch of the flesh of the potato still intact around the edges.) Set skins in a large baking dish. Add sour cream, butter, cream cheese, onions, salt, pepper, thyme, and milk to the potatoes and mash until light and smooth adding more milk if needed. Fold in cheese and spoon mixture into skins. Sprinkle with paprika for garnish. 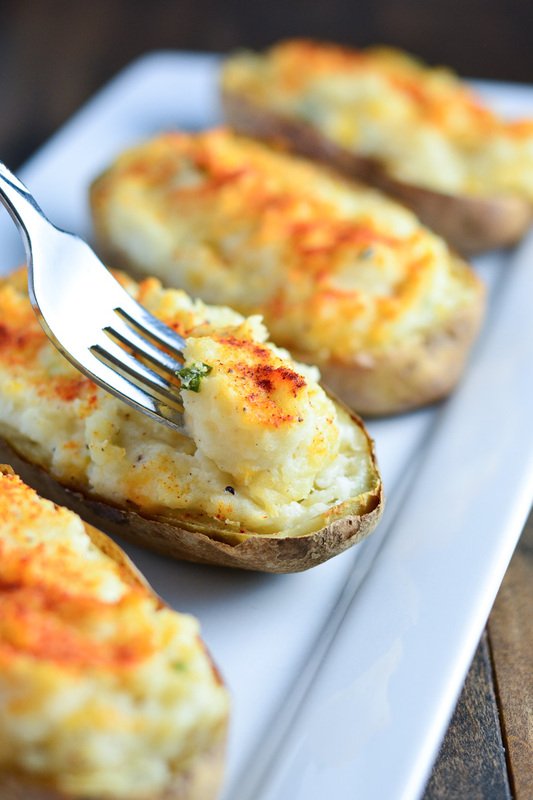 Craving all of the cheesy deliciousness of these twice baked potatoes right now. They look so incredibly delicious.. and it’s crazy that they are relatively healthy too! Could these be premade and frozen until ready to serve? My thinking behind this is that I would only need enough for 3 people, and these would be great to just pull out and thaw for a quick side dish. That’s such a good idea to make a bunch to have on hand for a side! I have only premade them and put them in the fridge. I think they should be perfectly fine to freeze. I’m not sure how quickly and evenly they will thaw though if you put them straight from the freezer to microwave. I would recommend taking them them from the freezer to fridge the night before you are going to have them. But let me know what you try and how it works. If you freeze them individually then vacuum seal them individually they are great for individual meals . They will last up to 3 months in the freeze. I make ahead and freeze. Make sure to heat them from frozen, either in microwave or oven, or they will be soggy. 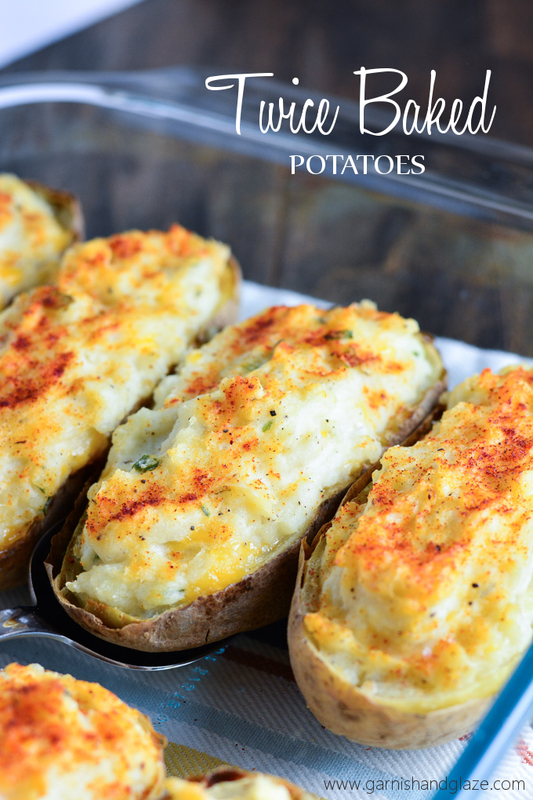 Of ALL the recipes for twice baked potatoes that I’ve found, this is by far the most appealing to me & my family. Simple steps & the ingredients are everything that my very picky family will love! I’m wondering if I can substitute the cream cheese for sour cream for the 1 person in my house that isn’t a huge fan (not that they’d even know) of cream cheese? I made these last night with steak and asparagus. They were so easy and delicious. My boyfriend usually teases me about my cooking fails but he went back for seconds and thirds of these! This is seriously a no-fail wonderful recipe! Will definitely be keeping this on hand for the future. I want to make these for our Christmas party this weekend but the party is 3 hours from my house. I was thinking of making them the night before, freezing them, and reheating them in the morning before leaving but am wondering if they would travel ok in a crockpot and keep them warm in that during the party. Would that work? Stephanie, You don’t need to freeze them. After you fill the skins just put them in the fridge. You can cook them right before the party and transport in the crock-pot or just put them in the oven for 20 minutes when you get to the party. What is the baking directions if I freeze the potatoes? Place the potatoes in the fridge the night before to defrost and then cook as normal. Loved these. Made them Christmas Day to go with prime rib. Did not use the sour cream and substituted chives for green onions. Definitely a keeper. Making these for game day! Thanks so much! I can’t wait for my husband to come home to work for these bad boys! I substituted the sour cream with Greek yogurt to feel ‘healthtier’ And add some additional protein! I also added some finely chopped jalapeños for an extra kick! Such a yummy and easy recipe!! Just made them and they were a total hit!! Made these last night! Huge hit! Didn’t use any onion or paprika. Everyone loved them!! Awesome addition to our “sides” rotation….